There is no doubt in my mind that Chocolate Chip Cookies are the ultimate classic baked good and comfort food. There is just nothing that compares to a warm gooey cookie right out of the oven. And a few years ago I set out on a mission to develop the most perfect chocolate chip cookie recipe ever. But this led to the question: What is my idea of the perfect chocolate chip cookie? Well, I am all about contrasts. So in my mind it needs lots of contrasts of textures and flavors. And I created that for myself. 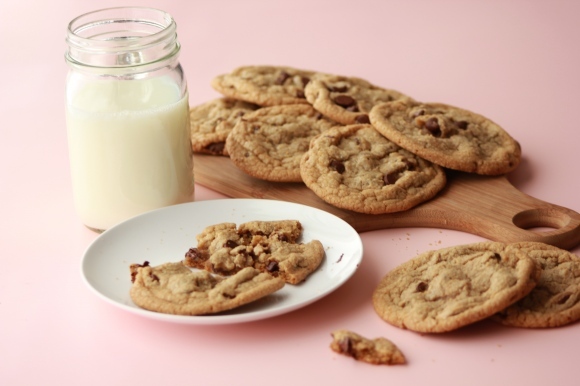 A thick, chewy on the inside crunchy on the outside cookie that has hints of caramel and salt with dark chocolate chips and toasted pecans. (Sorry, but I will most likely not share this recipe. I worked for a long time on it!!) But anyway, that was the start of my cookie business. READ MORE. This is Cookie 101, 201 and 303 the seminar all in one post. Everything you ever needed to know about the chocolate chip cookie but were too afraid, or as in my case too dumb, to ask. Have ‘em any way you want and don’t forget to scroll all the way down for Bettie’s recipe for the Slattern’s Kitchen Sink. Bettie RULES. Posted on February 12, 2012, in Baking, Dessert, Good to know and tagged Baking, Chocolate chip, Chocolate chip cookie, Cookie, Drink and Food, Recipe. Bookmark the permalink. 10 Comments. Ever heard of anyone making them with bacon? I think I could eat almost anything with bacon in it. I think the bacon thing is getting out of hand. Of course if you wanted to just sprinkle it over the cookies, or even serve it as a side….yeah, pretty much on anything. Blasphemer! There is no such thing as “out of hand” when it comes to bacon. Alternatively, you might say the bacon thing is at its most fun when it is out of hand.